As summer season is around the corner the lost love for tropical fruits and veggies have kind of revived. Both cooking and eating is a celebration,especially in India we attach a fine share of our memories with the smell of the food we eat or cook. Jackfruit is one such fruit that takes us back to those summer vacations we have spent with our grandmother during our childhood. This huge summer fruit is often referred to as an alternative of meat for the vegans and vegetarians due to its thick texture. Jackfruit being the largest tree-borne fruit in the world can be consumed raw or cooked into any dish. The best part about this fruit is all the parts are edible including the seeds. Jackfruit is a good source of nutrition and has various health benefits. You can eat it as a fruit or make it into a curry or bbq, roast the seeds or cook them into a spicy gravy. You can experiment with this versatile fruit as you like! Artocarpus heterophyllus commonly known as Jackfruit is a part of Moraceae plant family that includes mulberry, breadfruit, fig etc. It is a tropical fruit native to south India. It is widely used in various cuisines across Asia, being a versatile fruit it can be clubbed with anything and everything. Though it is mainly cultivated in south India but is widely available across the globe. 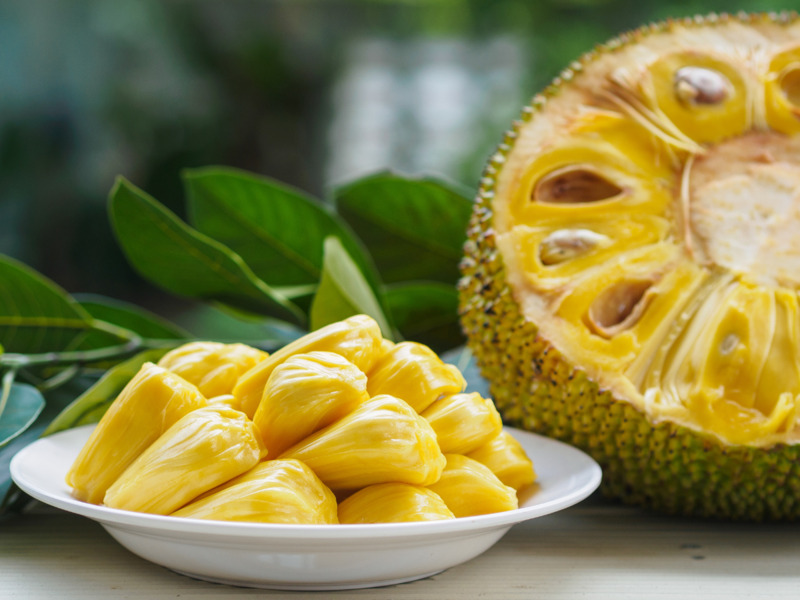 Jackfruit is an exotic fruit that can be eaten both in ripen and raw state. It has a spiky outer skin which is green when it is raw and turns yellow as it ripens. It is a huge fruit that is almost 55 kg in weight, 90 cm in length and 50 cm in diameter. It is eaten both as a fruit and a vegetable. It has sweet fruity taste when consumed as a fruit whereas it has a shredded meat like texture that makes it perfect to prepare curry and other savory delicacy. The raw jackfruit is often compared with potatoes as it doesn’t have any distinctive flavour of its own. It soaks up the masalas and combines properly with any other vegetable or for that matter with herbs and spices to make a perfect blend. The seeds of jackfruits are extremely nutritious and can be cooked into curries or served as a side-dish. Jackfruit is a nutrient-filled fruit which is often used as a substitute for meat. It has a perfect amalgamation of health and taste. Jackfruit has various benefits, you can definitely use this fruit in your daily diet to boost your immunity. It is filled with fibers and thus improves your digestion. It is known to cure constipation. If you are someone who is having constant digestion issues then try adding jackfruit to your daily diet. It is the store house for vitamin A and C which protects against viral infections. It is also a good source of antioxidants which helps in improving immunity. It has a moderate amount of potassium which helps in regulating the blood pressure and thus reduces the risk of heart stroke. Apart from antioxidants and vitamin C which is proven for its anti-ageing properties, jackfruit contents a good amount of water that helps in keeping your skin hydrated from within. A regular intake of jackfruit adds on your skin care regime and helps in making your skin better. It is a rich source of calcium which helps in making your bone stronger, it also has magnesium which helps in absorption of calcium. This dish is an alternative to your regular kofta curry or can be a substitution for spiced chicken curry. kathal kofta gravy is prepared with amalgamation of various Indian spices and other ingredients that gives bust of taste when paired with roti or rice. One of the popular sweet dishes of south India known as chakka pradhaman or palapazham payasam is prepared with jaggery, coconut milk and puree of jackfruit.This delicious payasam can be a great replacement for the regular sweets available in market, as it can be prepared at home using easily availabe ingredients. Try this mouth water dessert made with jackfruit and surprise your guests. This crunchy delicious mexican favorite tacos are made with an Indian twist. It is a healthy recipe made with chewy jackfruit, jalapeno, diced mango, some sauces and exotic seasoning, this colorful snack can be your go to dish for evening cravings. Jackfruits are extremely healthy and delicious,they are filling and can be a great alternative for newly turned vegans. Try these easy and yummy recipes at home without being guilty about gaining unnecessary calories and fat!